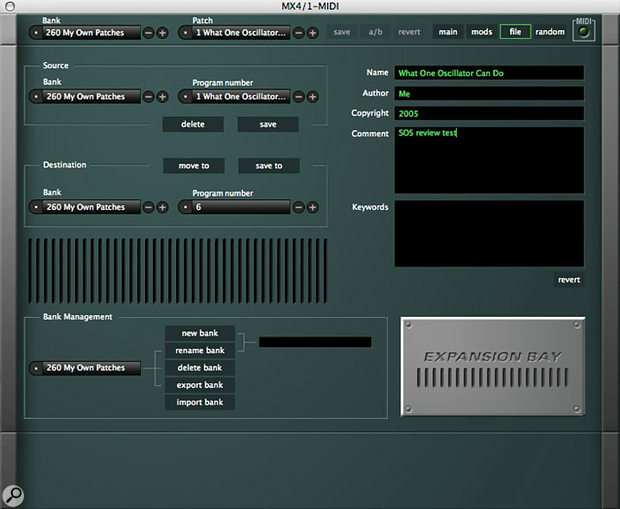 MX4 as it appears inside Ableton Live, a great package that also happens to be an Audio Units host. Mark of the Unicorn certainly got a few things things right with the launch of their Mach Five multitimbral sample player/editor. It's one of the most flexible products of its type, sounds great and is easy to use. Check out the SOS December 2004 review. And if a company sells a software sampler, they usually have a software synth. MOTU are no exception; the synth is MX4, version 2 of which is the subject of this review. Knowledge of Mach Five 's spec could lead you to make some snap assumptions about MX4, many of which would be incorrect. Though the two packages look graphically similar, the underlying engines are rather different. 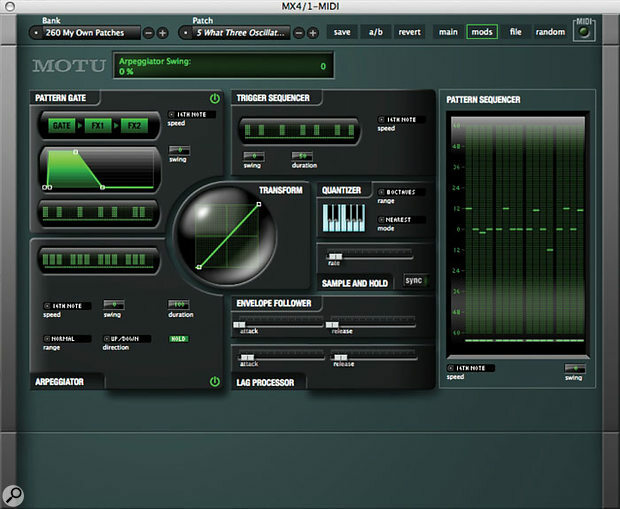 Mach Five is based solely on samples, using the excellent UVI Engine licensed from Ultimate Sound Bank. MX4 is modelling all the way as far as its signal path is concerned, and its oscillators appear to use a mix of modelling and specially processed samples for sound generation. Mach Five is multitimbral and can run as a stand-alone instrument (as of v2.0); MX4 isn't, and can't. The two packages also differ in another significant way. Mach Five is a cross-platform plug-in capable of running under almost any Mac or PC software host, no doubt because the original UVI engine was designed in this way. Sadly, MX4 is resolutely Mac-only, supporting MOTU's own MAS, Digidesign's RTAS and Apple's Audio Units protocols (Apple's Logic and Ableton's Live offer AU support; I ran MX4 under the latter). You read that correctly: not only is MX4 not available for PC, there is no Mac OS VST version provided either. I can't help thinking MOTU are limiting their sales here. The two packages do have some common features: on the one hand both use the irritating iLok security device, and on the other both are bundled with a detailed printed manual. The latter is good, by the way, though a little more detail in the explanations and illustrative examples might have been helpful. Each package also offers a feature set that tries to cover all the relevant bases without drowning its user with multiple OS levels. And, getting ahead of myself a little bit, MX4 also sounds great, like Mach Five. If MX4 is taking up too much screen space, reduce it to this little strip. You'll still be able to select patches and move to other pages. MX4 's architecture is essentially that of the classic analogue subtractive synth — it's a three-oscillator instrument, with two multi-mode filters, six LFOs, four envelope generators, and a comprehensive modulation matrix. Monophonic or polyphonic operation is possible, with portamento options. A pair of deceptively simple effects processors round out the sound. MOTU make some claims (and, on the whole, not too exaggerated ones) for MX4 's multi-architecture synthesis engine. Certainly, MX4 's oscillators are equipped with wavetables in addition to standard 'analogue' waveforms, but its three-operator Frequency Modulation (FM) implementation is appealingly straightforward rather than a rival for Yamaha-derived six-operator systems. AM (Amplitude Modulation) is also trumpeted in MOTU's publicity, but is really just an implicit extension of sound design — modulation with a patch — rather than a proper synthesis architecture. More than Mach Five, MX4 is a one-window package for editing purposes. Until v2 arrived, subsidiary pages weren't directly involved with sound design. And even without v2's new page of modulation sources, it's perfectly possible to hone a patch from the Main window. It's an admittedly large window, but it's one of the designers' achievements that you don't have to delve into a many-layered OS in such a complex and powerful synth. As an aside, if MX4 (or multiple instances of it) makes your desktop too busy, it can be reduced in two ways: the effects can be folded away, and all but a thin strip of the window can be hidden if you're not editing. Patches can still be selected from the strip (shown over the page), and subsidiary pages may be accessed if required. Operational simplicity means experienced synthesists can dig in immediately and start tweaking, but newcomers can still have a good stab at sound design without having to get a double first in physics and psychoacoustics before installation. I will note that some on-screen elements seem rather small or obscured by controls. A large display near the top of the Main window helps, by showing the changing value of any currently selected parameter. This takes some getting used to if you're expecting tool tips to pop up as you move the mouse across parameters. Pop-up menus are used, though, to assign modulation sources and MIDI controllers to parameters, as well as for copying and randomising parameter values. Name and organise your patches, complete with user-definable keyword searching, in the comprehensive File page. MX4 users are free to create their own folders for custom patches. It might seem like overkill, and can be very strange to work with, but a whole page — the File page — is dedicated to setting up folders, and making notes about your patches. The resulting folders join the main factory list on the Main page. In addition, new patches can be saved from the Main page, where there's also a Compare switch to check out the effect of your latest edits, and a Revert button that takes you back to the original patch if it turns out that you don't like what you've done! Incidentally, if you've hit a dead end and are looking for a quick sonic way out, head over to the Random page. This does exactly what it says on the tin, except that MOTU have given you control over which bits of a patch will be randomised, taking the current patch as a starting point. You can randomise the oscillators (while constraining the pitches to octaves and unisons or fourths and fifths if desired, to avoid dissonance), or the filters (including FM and topography — the filter and distortion routing options), or the LFOs and Envelopes. Sonically, everything starts with the three oscillators. You can create with one or two oscillators if you wish: disabling oscillators reduces CPU load and there are still huge possibilities offered by single- and dual-oscillator patches. Each can produce one of a standard set of analogue synth waveforms — sine, sawtooth and rectangle waves, and white and pink noise are also available. In addition, 'digital' variations of the sawtooth and rectangle waves are provided; they use less DSP power, but they do tend to create audible aliasing effects, which suggests to me that the 'normal' waves may be DSP-generated while the 'digital' ones may be samples. In practice, though, there's not much to choose between them; aliasing generally only becomes an issue when using an oscillator as a modulator of some kind. Then there are the wavetables, in two groups of 98 (the second was added with MX4 v2; the original wavetables, now dubbed 'digital', maintain compatibility with v1 patches). For those not in the know, wavetables are complex collections of processed sampled waveforms, which can be played back in series to create evolving sonic textures. Wavetable playback is governed by the Index parameters, which can be modulated to create textural and timbral effects that are hard to emulate with more conventional synthesis types. Depending on the wavetable you're using, you may hear noise, digital precision, delicate tones, or samples of synth waveforms. There's not a lot of help regarding the wavetables, not even a list in the manual. Names such as Bosch, Monopoly, Sufi and Vintage Mini are evocative, but don't really tell you the whole story. Others with names such as 'Square <-> Saw' are instantly comprehensible — here, the table morphs from a pure square wave to a pure sawtooth, providing you with every mix in between. A little oscillator waveform display helps enormously; you might not know precisely what's in the table, but seeing its waveform change as you sweep through it keeps you informed. No matter which waveform is selected, you have access to a Symmetry parameter. This is essentially a pulse-width control, normally dedicated to square waves but here adding oft-extreme (and modulatable) timbral changes to the most unexpected material. Other oscillator facilities are identical for Oscillators 1 and 2, with slight variations for Oscillator 3. For example, all three have a pitch slider, but that for Oscillators 1 and 2 has a range of -60 to +84 semitones, with cent resolution, if 'key follow' is engaged (the normal state of affairs if you're playing MX4 melodically). If you disable this function, the oscillators produce a fixed pitch over a range of 8.2Hz to 22.1kHz. This is great for modulation, and also for producing test tones, as illustrated by a range of 'factory' patches. Oscillator 3's pitch slider has a range of -192 to +84 semitones, allowing it to be used as a sophisticated LFO; its key-tracking parameter is a fully variable slider rather than a button, which means that the LFO effect can track the keyboard, an interesting option rarely found elsewhere. The full range of waveforms (including wavetables) makes this aspect of MX4 well worth exploring. In addition, Oscillator 3 is the modulator for the other two Oscillators in a simple FM 'algorithm' that can be stretched further than expected due to the wide range of source waveforms available for each 'operator', and saying nothing of the conventional modulation options on offer (of which more in a moment). In this mode, Oscillator 3 doesn't even have to be enabled. Oscillator sync is provided between Oscillators 1 and 2, enabling classic powerful analogue leads and basses to be created, and ring modulation is another blast from the past, producing the expected clangorous tones from the first two oscillators. Ring mod is actually placed in MX4 's basic mixer section, not illogically. This option encompasses the Level and Pan controls for each oscillator (the latter only when stereo operation is enabled), plus the controls for the synth's audio input. Signals appearing at the latter are mixed with the synth sound proper before being treated to the synth's filters and effects. The mixer also offers a 'Fundamental' knob, which makes sense if you've created a heavily filtered, modulated patch that sounds great but has lost its tonal centre: this knob, derived from Oscillator 1, returns a sense of pitch to the sound. Next stop in the signal path is a pair of mixable multi-mode filters and a distortion unit. On the face of it, the filters are well specified, providing what you would expect: low-pass, high-pass, band-pass and band-reject types with slopes of 6dB, 12dB, 18dB or 24dB. You have control over frequency and resonance (to self-oscillation), as well as key tracking. But things get more interesting — and not just because you can drag the filter response curves with the mouse to edit them. MOTU have added an FM option for each filter, with Oscillator 3 again the modulator. There's real room to play around inside a sound here, especially if you exploit the modulation options; a filter with a modulated FM parameter produces a somewhat different effect than if the same modulation was being applied to cutoff frequency or resonance. Best of all, though, is the choice of serial and parallel configurations of the two filters and the distortion module. Sonically, these are meaty, characterful filters, and MOTU have obviously taken the American classics (Moog, Sequential and so on) as their inspiration. The Mods page introduced with MX4 v2 offers all sorts of neat toys. Used together, the arpeggiator, pattern gate, pattern sequencer and trigger sequencer almost create the effect of composing algorithmically. There is no dedicated filter envelope generator, but with four possible EGs, I'm sure you can set one aside for the task. The EGs are largely the same, with all offering a five-point envelope plus delay parameter. Attack, Decay, Sustain and Release are joined by a 'Hold' value between the Decay and Sustain stages. Envelope 1 is fixed to amplitude (level), though it can, along with the other three EGs, be assigned to any modulation target (practically any parameter). A range of triggering options include polyphonic, mono, and external MIDI, and a funky, mouse-draggable display shows the envelope curve. My only gripe here is that there's only one set of controls and one display shared between the four EGs. Three oscillators, two filters, four EGs... the numbers are flying thick and fast. Now how about six LFOs? Another great display finishes off this neat design — check out the circular feature in the middle of the window. It's a little strange at first, and some of the text is obscured by the sliders, but you soon get the hang of it. The main controls are ranged around the waveform display, and the LFO to be edited is selected by a clearly labelled button. There are no fixed routings for the LFOs, apart from a couple that show up in the patches MOTU provide; you're free to make those decisions yourself. The waveforms offered by the LFOs are sine, sawtooth, rectangle, sample-and-hold, sample-and-ramp, and 'random walk'. The remaining parameters include the straightforward — Delay and Rate — and the creatively unexpected. As with the main oscillators, we have a Symmetry parameter (like pulse width for an LFO), plus a Phase slider. The last of these selects where in the waveform's cycle the LFO 'effect' starts; there's an option for random and free-running phase. A free-running LFO just keeps oscillating regardless of whether you're playing any notes or not. It should come as no surprise that MX4 includes some basic effects processing — to be precise, a modulation processor and a time-based processor. In v1 of MX4, just chorus and delay were provided, but with the launch of version 2, you can select from chorus, flange and phaser in the modulation processor, while the time-based processor offers delay and reverb. CPU load is relatively low, but there is some impact: watch yourself if your Mac (like mine!) is a little slower than the current norm. There aren't many controls, and you can still only have two effects running at once, but the result is pretty good nonetheless. Being able to save effects as part of a patch, and to freely assign parameters as modulation targets, helps stretch the effects even further. The modulation section has just four parameters. Mix, Rate and Depth are always the first three, and the Chorus has Delay as the fourth. The Flanger has Feedback as the fourth, while the Phaser offers Width. The new reverb also has just four parameters: up to 60 seconds of Decay Time, a High-frequency Damping parameter, Stereo Spread and Mix. The delay, however, which has a tempo-sync option, has eight parameters. The left and right channels have independently tweakable delay times, with positive or negative feedback: the range is 0 to 2000 milliseconds in free-running mode, or a 64th note to a bar in sync mode. Dotted and triplet values are included in a comprehensive list. Further sonic manipulation is possible courtesy of a filter: high-pass, low-pass, band-pass and notch types are available, with independent left/right frequency controls plus Resonance. It's ideal for creating retro low-bandwidth effects. Even before version 2 of MX4 was released, the instrument had a pretty good spec, with plenty of modulation options which are still present and correct. Sources can be routed and cross-modulated with ease to create complex patches with real movement, thanks to the built-in modulation matrix, which offers 16 sources that can be freely assigned to any parameter on the synth — and any number of parameters can be assigned to one modulation source if you like. Assigned parameters change their appearance: they split so that you can set a modulation range and centre point, and you're able to see the modulation effect take place, though the graphics involved in each parameter are rather small. 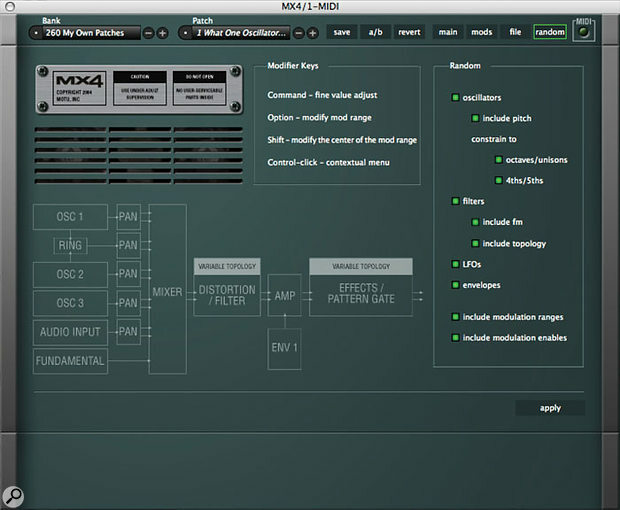 With four EGs, six LFOs, aftertouch, mod wheel and almost any other incoming MIDI data selectable as a source, an MX4 patch can really 'move', either free-running or responding to playing style. Not only that, but the modulation source itself can be further 'shaped', or modulated, either by another modulator or one of the new shapers I'll come to in a moment. A simple example would be to cause an LFO effect to increase with the tweaking of a mod wheel or velocity. Version 2 of MX4 further enhances this already-impressive spec with the new Mods page, which adds an arpeggiator, pattern sequencer, pattern gate and trigger sequencer. The arpeggiator has no real surprises, but is well specified: direction, octave range, note value, swing and arpeggiator pattern can be tweaked by the user. The pattern sequencer is like a cross between a programmable arpeggiator and a step sequencer, though it can modulate any parameter, not just pitch: it offers up to 16 steps, each with a range of ±60 (these units are semitones if the sequencer is routed to pitch), with Note Length and Swing parameters. The Pattern Gate is allied in a way to the effects: it slices up MX4 's audio output in response to a pattern of up to 16 pulses. There are Note Length and Swing parameters, and a four-stage envelope for the pulses. In a similar vein, the new trigger sequencer allows rhythmic patterns to be applied to the envelope generators, for rhythmic effects within a sound, rather than chopping it up like the Pattern Gate. All four of these new options automatically derive their tempo from that of the host application when the sync option is selected, as do the LFOs (and the Delay effect). There is no option to set an independent tempo inside MX4. The Mods page also adds a handful of 'modular' type processors. For example, an Envelope Follower uses the amplitude of the audio input as a control signal for MX4 parameters. Then there's a lag processor that applies a simple envelope-type effect to a modulator's output. This helps smooth out the signal's response, and with a pitched modulation target, the result can be rather portamento-like. Sample and hold, another new Mods option, can be applied to any modulator. It performs in a similar manner to the S&H waveform provided for the LFOs, although it's less random and offers much more user input over its response. A circular display, similar to that used by the LFOs, shows off the new Transform Shaper; apply this to a modulator's output and you can alter its response, or invert it completely. Lastly, the new Quantiser Shaper works with a pitch-based interface, but can be used to constrain the range of modulation sources in very particular ways. The most audible results will be heard when the modulator is routed to a pitch-based target. In a creative rut? Pushing a few buttons on the Randomise page might get you in the groove again. The currently selected patch is taken as the starting point. MX4 is one of the best straight-ahead synths I've played with. It does pretty much everything you'd want a basic classic 'analogue' synth to do, and then some. It has a sound that soars, and just poking around with the modulation options quickly produces patches that move and respond to your playing. There is little to complain about. Had I been reviewing v1.0, most of the features offered in v2.0's Mods page might have been on my wish list, but MOTU have obviously been thinking hard about this one. Even the price seems right. The lack of multitimbrality is countered by being able to load multiple instances, and the CPU load when you do this is surprisingly manageable, especially if you have an up-to-date Mac and you're careful with your programming. For example, enabling filters means more CPU overhead, so why not audition a few wavetables that might produce the sound you're after? To give you a practical idea, my old wreck of a 450MHz G4 — I really must get this updated! — managed four instances of MX4 loaded with sensible but not overly complex patches inside Live, alongside a drum machine plug-in. With more complex patches involving both filters and the arpeggiator, and with the pattern sequencer and pattern gate enabled, I was starting to experience problems with just two instances running. 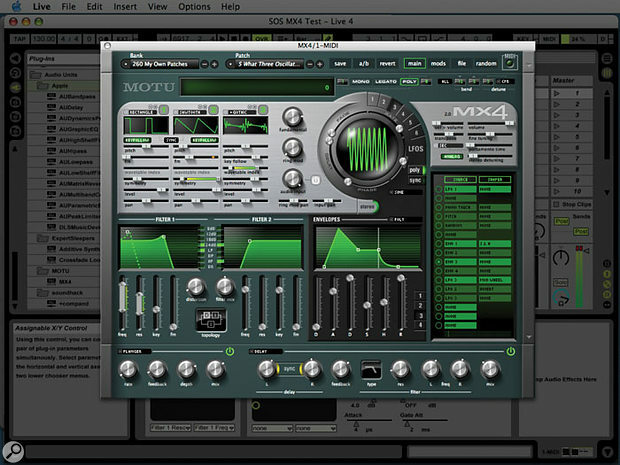 MX4 may lack the real modular approach of some hyper-detailed synthesis environments, but the modulation matrix puts a lot of this functionality easily within reach, courtesy of a transparent user interface. In short, it's a deep synth with a simple front end — the best combination! Of course, if you're a PC user, you won't even be able to try out a demo. And if your application hosts nothing but VST instruments, then MOTU aren't on your side either. For everybody else, though, MX4 is more than worth a listen. It's practically worth buying 'unheard' — and I don't say that lightly! Powerful synth features, great modulation options. It's a shame that this is a Mac-only instrument, because it's a top-notch synth. It's so simple to use, yet has so much flexibility, and quietly puts a lot of the competition in the shade.